From the moment you open the doors of Lowe Tide, you'll feel the luxurious ambiance pull you in, as the moon does the low tide. As you enter, you are welcomed with an open floor plan including the kitchen, dining, and living spaces all flowing as one, a half bath, and master suite with private bath. 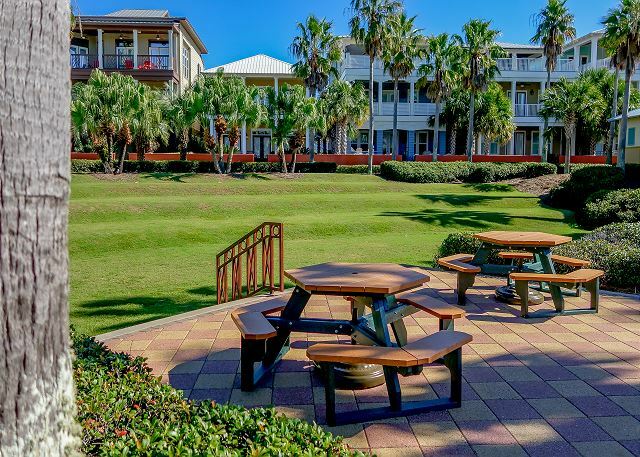 The patio offers a grill and plenty of seating for BBQ fun with easy-private access to the 12,000 sq ft lagoon pool of Seacrest Beach. Head upstairs and you'll find another elegantly designed master suite with private bath. Down the hall you'll find the laundry room, and 2 bedrooms (1 King / 1 Queen) sharing a private bathroom. On the third floor you'll find a tranquil family room with a custom bunk bed and full bathroom. The balcony offers stunning views of the lagoon pool and its surrounding homes. This house comes fully equipped with DirectTV's premium package, as well as free WiFi! Don't feel like cooking? There are several restaurants within walking distance including the newly completed open huts with shops, and restaurants are surrounded by the grass-covered commons area of the Towne Centre. Each brightly colored, gabled unit is easily identified and inviting for both regular customers and newcomers alike. From sunglasses to souvenirs, hop into one of these kiosks to find just the right thing. Come stay with us to enjoy all the great activities and natural beauty this area has to offer!